Sheila Bair, who was named chairperson of the Federal Deposit Insurance Corporation (FDIC) in 2006, has reiterated her view that the best approach to resolving the current housing crisis is to encourage lenders to renegotiate mortgages with homeowners. Bair’s proposal calls for a loan modification program so that payments are reduced to 31% of homeowners’ gross income (Sasseen & Francis, 2008). The federal government would guarantee to cover part of the losses if the homeowners re-default despite this assistance. Bair claims that this approach would save 1.5 million homeowners and would cost the federal government approximately $ 24.4 billion (Sasseen & Francis, 2008). The proposed approach has faced a barrage of criticisms and doubts. Some have claimed that the renegotiation of millions of mortgage loans will take too long to have a practical effect (Wallison & Pinto, 2008). Others have pointed out that it will be difficult to renegotiate certain types of loans, particularly those that have been securitized, or sold to investors (Sasseen & Francis, 2008). Critics have also argued that previous efforts to renegotiate mortgages have not been particularly successful. Specifically, there is evidence that more than half of the mortgages renegotiated during 2008 are already at least 30 days past due (Sasseen & Francis, 2008). Treasury Secretary Hank Paulson argues that Bair’s plan is problematic because it increases government expenditures and it rewards banks when homeowners default (Sasseen & Francis, 2008). Alternative solutions have been proposed for the housing mess, but these too have perceived flaws. For example, bailing out the major mortgage companies might simply encourage further risky practices in the future (Murphy, 2008). Treasury Secretary Paulson claims that the best approach is to reduce mortgage rates, in order to encourage more home purchases. However, this approach has been criticized because it won’t help borrowers who are already in trouble (Sasseen & Francis, 2008). Martin Feldstein, a Harvard economist, has suggested that the federal government should make loans to troubled homeowners to cover 20% of their mortgages (Feldstein, 2008). However, this raises the risk of borrowers, in turn, defaulting on their debts to the government (Murphy, 2008). There is, additionally, widespread sentiment that helping companies or borrowers who got themselves into trouble is unfair to those who made more reasonable financial decisions. The housing crisis came about because trillions of dollars of mortgage loans were made to borrowers who were not really able to repay the loans. Many of the loans were based on adjustable rates that greatly increased the size of homeowner payments after a certain period of time (Murphy, 2008). The situation led to a growing number of defaults and a substantial decline in housing values. The proposed solutions to the problem are based on the question of whether it is better to assist mortgage companies or borrowers. There seems to be a partisan divide on this issue, since many Democrat politicians, such as Bair, are in favor of helping borrowers, while Republican leaders, like Paulson, are in favor of helping the big companies. In spite of this controversy, there is widespread agreement among policymakers that the most important step is to strengthen regulation of the housing market and the mortgage industry (Murphy, 2008). Feldstein, M. (2008). How to help people whose home values are underwater. Wall Street Journal (November 18), A21. Murphy, R. P. (2008). Can the Feds save the housing market? Freeman 58(5), 8. Sasseen, J., & Francis, T. (2008). A standoff over housing relief. Business Week (December 22), 30. Wallison, P. J., & Pinto, E. (2008). Let’s use Fannie to clean up the mess it made. Wall Street Journal (October 25), A13. myAutoloan.com, an online direct to customer auto finance company, has seen a 113.4% percent increase in applications for the second quarter 2009 compared to second quarter 2008. Just as dramatic, comparatively, the second quarter of 2009 to the first quarter 2009 has shown an increase of 77.6%. The demand for direct to consumer auto finance has jumped significantly during the first six months of 2009. Finance applications for the purchase of new and used cars as well as refinance loans, has risen sharply due much in part to the increase demand for the limited indirect financing that is available through traditional channels at dealerships. These traditional channels have left consumers without options thereby leaving consumers to apply online in search of alternative financing. They have been driven to expand their search options and through the internet, the consumer is finding alternative financing solutions. This is clearly resulting in the large increase of auto loan application volume. Peterson also stated that, “As we monitor the month to month activity, the strength of the demand from direct consumer financing customers continues to search for a relaxation of some of the overly cautious parameters they are evaluating applicants by. We’ve seen interest rates increase, and credit qualifications become so narrowly defined that all anyone can do is wait for lenders to increase their activity. We seriously believe that it’s a matter of time before visionary companies enter and capture market share in this direct to consumer market. As the economy stumbles along, Guardian Solutions has become inundated by large numbers of business owners with income producing commercial properties that require loan restructuring to keep their doors open. The U.S. unemployment rate is nearly 10% according to official government statistics, but what the government fails to clarify is that these numbers do not represent individuals who are not eligible for unemployment benefits and part-time workers who would prefer to be full-time. In reality, with those factors considered, true unemployment in the U.S. is closer to 17%. With the unemployment rate as high as it is, the last thing this country needs right now is a slew of securitized commercial property foreclosures on businesses that are employing people, said Jeramie Concklin, CEO of Guardian Solutions, a commercial loan restructuring firm that has been helping its clients avoid reaching the foreclosure stage and helping them return back into income-producing assts. Now add to this already dismal economic situation the fact that commercial real estate industry analysts expect delinquency rates leading to foreclosures to increase further through this year and to peak in late 2011, early 2012. Moreover, Deutsche Bank estimates that around $ 2 trillion in commercial mortgages are expected to come due within the next four years. Short of a loan restructuring, commercial property-owners may suffer the consequences of losing their income-producing asset, which subsequently will produce even more unwanted repercussions on the economy. Lending institutions will feel the effects severely if they have nonproducing assets in a market flooded with foreclosed properties, adding to even further illiquidity in the credit markets. The logical solution is for banks and commercial borrowers to agree on a mutually beneficial modification or restructure. There are various restructuring methods a bank can take. One way is for banks to decrease their rates permanently or temporarily, which can help borrowers avoid foreclosure. A fractional drop in interest rate may eliminate tens of thousands of dollars from a property-owners annual debt burden, and potentially, save hundreds of thousands if not millions for the lending institutions because now the property in question has avoided foreclosure. The point is to give borrowers the time and the tools necessary to stabilize the property and turn it back into a positive-cash-flow business. Doing this allows the lending institution to book the property as a Performing Asset. Another scenario is how to effectively deal with the maturation of a loan. Banks might need to extend the maturity dates on loans to push back untenable balloon payments and keep the borrower in business. By doing this, the bank is ensuring the property continues to be a performing asset, not a liability that potentially needs to be sold at auction for an amount below the existing Note. Because of the technical and legal aspects involved with restructuring a commercial loan, many property-owners may ignore their position and accept foreclosure rather than work proactively to save their investment. Commercial loan-restructuring companies exist, however, and at times can help stressed property-owners navigate the complex procedures, negotiations and nuances associated with a successful loan workout. Guardian Solutions is the one of nations largest commercial loan restructuring companies and is committed to helping commercial property owners save their properties. The companys seasoned team is experienced in a variety of disciplines and able to provide customized restructuring solutions. For more information, visit http://www.GuardianSolutions.org. Although the U.S. economy appears to be showing preliminary signs of recovery with the stabilization of some large financial institutions, the commercial real estate market continues to be negatively affected by the ongoing decline of home prices, the high rate of commercial loan defaults and an unmoving high unemployment rate. Treasury Secretary Timothy Geithner recently darkened this scenario by warning that unemployment could continue to rise before subsiding. Jeramie P. Concklin, CEO of Guardian Solutions, a commercial loan restructuring firm based in Florida had this to say, The rate of growth of delinquencies in commercial mortgage-backed securities (CMBS) real estate loans did show some slight signs of moderating in July, but despite that, we are still seeing very high numbers of new distressed commercial mortgages in need of restructuring every week as evidenced by CMBS delinquencies surpassing 60 billion dollars, an increase of 3.11 billion from just the month prior. A bright spot in this gloomy scenario is surfacing due to the efforts of independent commercial loan restructuring firms such as Guardian Solutions. According to Trepp, a leading provider of CMBS and commercial mortgage data and analytics, a recent trend has emerged that is having a positive effect on CMBS loans due to the increase in loan modifications by lenders. Loan modifications through July of this year already have surpassed those for all of 2008 and 2009 combined. Loan modifications (have) accelerated dramatically in 2010, the Trepp report said. This puts downward pressure on the delinquency number, as troubled loans get resolved and move from the delinquency category. Based on the successful commercial loan workout results weve been getting for our clients, I can see that the biggest mistake that property owners tend to make is to do delay addressing the issue at the first sign of trouble, or even worse, to try to deal with lenders or special servicers on their own. But that being said, commercial property owners should know that they can take steps to improve their situation by seeking professional help and guidance while the situation is still salvageable; the longer they wait to act, the more difficult their situation becomes, added Concklin. Commercial property owners who are trying to keep their properties viable are seeking help from firms like Guardian Solutions that specialize exclusively in commercial loan modification. Currently, there are only a handful of specialized firms that hire highly qualified employees, such as accountants, MBAs and real estate professionals to deal specifically with the complexities involved in a restructuring a securitized commercial property. Guardian Solutions helps commercial real estate owners in distress every day, said Concklin. We are saving all types of commercial properties facing default. But the sooner we get into negotiations, the more options we have available to help. A restructuring plan thats put in place early on usually contains the most favorable terms and achieves the best results. With the dismal forecasts we have for the economy and for the commercial real estate market, its the wise property owners who are taking a look at their assets and preparing now for the eventual market declines. The technical and legal aspects involved with securing a commercial loan restructure prompts many property owners to ignore their position and grudgingly accept foreclosure rather than save their investment. This can result in more than just losing the property, it can severely damage the borrowers credit and even lead to personal bankruptcy. Hackman Capital, a privately-held industrial and commercial real estate investment firm, announced today, on behalf of its affiliate, the closing of a $ 5 million loan to permanently finance the acquisition of three creative office buildings in Culver City, California. 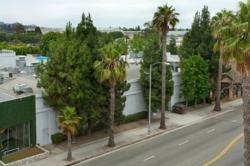 The office, recording and production studios, totaling 32,248 square feet, are 100% leased by Westwood One. Inc., the country’s largest independent provider of network radio programming and traffic information. The Hackman Capital affiliate acquired the portfolio in an all-cash, sale-leaseback transaction in December 2009. The non-recourse financing was arranged by Los Angeles based capital markets advisor, Verona Capital Markets(VCM), who obtained the loan from a major Wall Street investment bank. The loan provided 10-year, fixed-rate financing with a 30-year amortization period and a 5.99% coupon. The proceeds of the loan were used to repatriate equity to the sponsor and its investors. VCM was able to mitigate the risk associated with a single, non-investment grade tenant by highlighting the superior sponsorship behind the transaction, including its track record of operational excellence across its portfolio and its extensive experience in the Culver City submarket, said Eliav Dan, VCM’s managing principal. In addition to highlighting Westwood Ones longstanding occupancy of the buildings and the financial commitment of its majority equity stakeholder, local private equity firm The Gores Group, Dan noted that VCM assuaged the lenders concern regarding a downside scenario by emphasizing the location of the project in reinvigorated downtown Culver City, the fungibility of the buildings, the loan amount relative to land value and the go-dark value of the buildings. Hackman Capital, which is based in Los Angeles, has been investing in industrial and office properties since 1986. Although the company and its affiliates have a large national presence, with an existing portfolio including more than 56 buildings and 16 million square feet in markets across the country, the company is proceeding with investment strategies focusing on Southern California and the West Coast. Of the 13 properties Hackman Capital affiliates already own in Southern California, five are in Culver City. The three Westwood One Studios are located in the Hayden-Higuera district at 8960 Washington (9,668 square feet), 8966 Washington Boulevard (14,780 square feet) and 8944 Lindblade Street (7,980 square feet). company is based in Los Angeles, California. More about Verona Capital Markets Inc.
Verona Capital Markets Inc. is a full service real estate investment banking and capital markets advisory firm based in Los Angeles. VCM specializes in arranging structured debt and equity financing for all types of commercial real estate investments throughout the country and represents financial institutions in connection with the disposition of performing and non-performing notes and REO. In their previous capacities as lenders and lenders counsel, respectively, our principals have been involved in virtually every facet of the securitized lending process, including loan origination, structuring, underwriting and documentation. For more information about VCM, please visit http://www.veronacapitalmarkets.com.